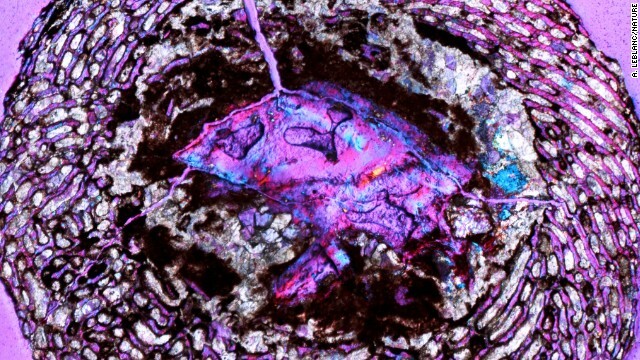 A color-filtered image of a dinosaur embryo fossil shows a preserved thigh bone. The honeycomb-like structure is bone tissue. Everyone knows dinosaurs were gigantic, but they grew from tiny embryos just like birds do. What were these extinct reptiles like at this early stage of development? Scientists have found some new clues that could shed light on this age-old mystery. In a study published Wednesday in the journal Nature, scientists said they have discovered the oldest known collection of fossilized dinosaur embryos. "In a way, I think we have set a new standard for dinosaur embryology," said paleontologist Robert Reisz, the lead study author. Scientists found these dinosaurs grew extremely fast in comparison to present-day living animals and even flexed their muscles while still in the egg. The bigger the spaces between primary bone cavities, the faster an animal grows. These bone cavities house soft tissue responsible for blood vessel generation. "In other animals, about 15% to 45% of the embryo bone tissue is made up of these soft tissue cavities; in these dinosaur fossil samples, we found the cavities to make up roughly 60% of the bone tissue," Reisz said. "Since little is known about the growth patterns of dinosaur embryos, we can't tell you how many days it took for the incubation to be complete, but this is the first time we have been able to study the different stages of dinosaur embryo incubation and examine how the dinosaur embryo grew." Scientists stumbled upon the embryos in China's Yunnan province in the city of Kunming, roughly 1,242 miles south of Beijing. It is known for being one of the world's oldest embryo preserves and a treasure trove for paleontology. The newly discovered embryonic dinosaur bone bed was nestled in the lowest, most richly fossilized region of the Lufeng Basin. The remains were not found in one, comprehensive intact skeleton; rather they were from a cross-section of various fossilized embryos. The bone fragments - some as small as pencil lead - were from sauropodomorphs, a group of dinosaurs known for their gigantic size, with some of these terrestrial vertebrate growing up to 9 meters (29.5 feet) in length. To understand the significance of these embryonic fossils dating back 190 to 197 million years ago further, scientists from mainland China and Taiwan teamed up and called upon experts across multiple disciples and continents. "We had paleontologists working hand in hand with chemists, physicists and geologists," Reisz said. "This is a breakthrough in how we approach dinosaur paleontology," adding that "this has never been done before." Scientists used synchrotron radiation and highly advanced infrared spectroscopy to isolate the main bone crystallizing structure, from which they took uncontaminated samples. They examined the ossification, or bone growth patterns, of more than 200 fossilized embryonic bone fragments from a single species. Reisz said he and his colleagues were excited about what the findings mean for paleontology but they have much more excavation work ahead to gain a more comprehensive understanding of the origin of dinosaurs. If you think amitie's story is nice, 2 weeks and 6 days ago my uncles step son's, son made $8079 working 11 hrs per week from his bedroom closet using a vintage Commodore 64 computer and a bag of circus peanuts. That following Sunday, after a short evaluation, he was Baker Acted. Glad to see there’s a very comprehensive team working on studying the dinosaurs. Wish scientists get more breakthroughs from working hand in hand with philosophers, naturalists and astrophysicists. Sarah Palin believes that the earth is only 6,000 years old. Sarah Palin believes that early man rode dinosaurs to church every Sunday and parked them in the Roman coliseum. That would be the plot to the Flintstones cartoon. Holy hell. I expected a great article and the first thing I read is that dinosaurs were reptiles. Dinosaurs were not reptiles. Pterodactyls were reptiles, dinosaurs are not. How can I trust a science article that misses something so basic. Yes, I was irked as well. Can't look at a chicken without....well, you know. Umm, Dinosaurs are in fact reptiles, you might want to check your facts before commenting next time. You might want to take your own advice, Ace. Dinosaurs were not reptiles, they are an entirely different group. Do some research. Sorry Shane, I remember hearing Dinosaurs weren't reptiles either, but it turns out they were a type of reptile. If you actually did some serious research, you would not state that dinosaurs are reptiles, but endotherms. Thomas - While dinosaurs, despite the name ("terrible lizard" ) were not lizards, most authorities agree they were reptiles.Their modern descendents are birds. Sorry to hear about your Gandfather. Still, I'd bet you Grammer was a good woman. So the fast growing dinosaurs allowed biblical man to quickly replace his mounts! "Scientists used synchrotron radiation and highly advanced infrared spectroscopy to isolated the main bone crystallizing structure, from which they took uncontaminated samples"
It's TO ISOLATE, not ISOLATED. I know that no one gives a crap about grammar anymore, but really expect more from people that have to type all day. My wife complains I have terrible grammar. My response to her is "Honey, I would rather say 'I is rich" than 'I am poor.'" ICalm down. I doubt that the writer actually intended to type in "isolated" and was okay with the affected sentence. What we're looking at is likely just a spelling brain-fart. I can when people point out a mistake to be corrected. But when someone says "I expect more" instead of just pointing out a mistake, it just inspires me to leave the mistake in there. BioHzrd420, you're such a slacker. "called upon experts across multiple DISCIPLES and continents"
Why is it science news always brings out the crazies? Run an item on a new consumer gadget or the latest diet plan or even the deadlock in Congress and you might provoke an argument or two. But report on the confirmation of the Higgs boson or a more precise measurement of the cosmic background radiation or the discovery of a new fossil and the ignorance rises like the odor of a dead skunk. Every gallus-snapping gum-smacklig expert will crawl out from under the refrigerator to do battle. Is it because any random mortal can say something intelligible about an improved home appliance or the latest fad diet or even on politics. But it takes real expertise and hard work, not to mention deep thought, to make and understand a scientific discovery? Or is it because some folks' grasp on their religious beliefs is so tenuous, so shaky that they're afraid the least puff of knowledge will blow it away? I kind of suspect the latter. If your belief in God depends upon the non-existence of dinosaurs or the universe not being billions of years old, then you're in deeper trouble than you can imagine, oh Ye of little faith. God the Creator, created everything in existence, yes, even the dinosaurs. I have no problem with dinosaur bones or fossils at all, only they're not billions or even millions of years old. The dating of science is seriously flawed. Whatever is "discovered" in the earth or in the farthest reaches of other galaxies, God the Creator, created it. His power and might is beyond the limits of your imagination and certainly beyond the measuring of any instruments of science. Thank you for acknowledging my creation. So how old exactly are they? Are you subscribing to the Christian theory that the Earth is only 10,000 years old? BigStuff - That Earth is 10,000 years old is not "Christian theory." It is a claim by Biblical literalists. As a lifelong Catholic I can assure you that the Church has long since come to accept Darwinian evolution as a scientific explanation for the rise diversity and abundance of life. Which god? We've invented tens of thousands in the 200,000 years we've been modern humans. And please post the citations to the peer-reviewed scientific research showing radiometric dating is wrong. "The dating of science is seriously flawed." No, we can date the occurrence of our scientific discoveries pretty well, since the dates are written on the articles themselves. However, I think what you really mean is "The science of geologic and biological dating is flawed," though you provide no evidence, example, or reason as to why is it flawed, except to imply that it does not align with the dates put forth in the Bible. This is not reason enough to conclude the methods, analysis, and interpretation is flawed. You are trying to argue against physics and chemistry with the words of man. Try harder. The irony is your username is "CommonSense"
Ok you guys are right. Got does not exist. I was wrong in my previous post. In reality it's all just a myth and the only reason I believe it is because I'm scared of dying. Christians often tell me that god is all-powerful, all-knowing, perfect, and loving. If this is true, then god can do anything he wants, any way he wants. Yet god CHOSE to create man flawed, subject him to pain, suffering, death, and threaten him with eternal damnation and torture. Their claim of god's nature does not mesh at all with their claim of his actions. His actions state god is flawed, limited, arbitrary, and hateful. So which is it? Considering the bible doesn't actually mention dates or clear-cut definitions of time, I believe the methods of interpreting the bible's timeline is seriously flawed. Someone or some group of biblical scholars decided a day is a year and a year is a day and an hour is day and so on, and that has been passed down to you. You choose to believe this, great. But, understand that the bible, any edition, doesn't state, anywhere, that all of existence is 6,000 or 10,000 years or whatever thousands of years old. It's all based on interpretation of its actual words, and you choose to believe those interpretions. If i were to follow one singular defining book explaining to me the entire history of all of existence, I'd expect it to not be written in some secretive code that must then be de-coded through the brains of Humanity. If it must be de-coded that way, then it is a guess, and not a fact. Common Nonsense - Here's a challenge: Produce scientific evidence that present methods of dating are "serious;y flawed." That evidence must come from a reputable scientific journal or research that as been reported and tested. My guess is that you can't do this, but I could be wrong. Here's your big chance to back up your claim and strike a blow for Biblical literalism. We'll all be waiting to hear from you. How do you ever expect to get anywhere when your cart is before your horse? Here's anotehr query for ya... if god is all powerful, can he create a rock he cannot lift? Wheres your evidence? science provides proven methods, where your bible provides bronze age guesses. Hats off to you, sir. I marvel at the coherence of your comment. I think of them all as "Flat Earthers", so I can cover as much ground as possible. Dear scientists..... I'd really, really like to see a living/breathing dinosaur in my lifetime. So without meaning to sound impatient or rude... could you please work a bit faster. Thanks in advance. Uh-uh, Alligators are members of the family Crocodylidae. They existed before dinosaurs and are only distantly related. There are profound anatomical differences between the two. Lol. I think he was thinking more along the lines of a T-Rex or veloceraptor. I think if he got his wish and he actually saw one I think he might be praying that they don't see him. What would this mean to you? We need reminding that those here who hope to use the Bible to beat dinosaurs and Darwin into non-existence represent only a tiny slice of believing, Creed-confessing, church-going Christians, the majority of whom have no problem with evolution, and an even more negligible slice of those who believe in God, under one name or another. The "scientists" who believe otherwise are as ignorant of religion as the Bible-thumpers are of science. And possibly moreso. Sadly, no. In the latest Gallup poll on this from a couple years ago, 46% of adults believe that god created humans in their present form less than 10,000 years ago. Primework - As I sad elsewhere on this forum, I don't get my science from the Bible and I don't get my theology from Darwin pr Dawkins. If that's "cherry picking what you want to believe from the bible and scientific fact" then I'm a cherry picker. But it also means that I'm rational. Primewonk - That same poll showed only 15 percent believe that man evolved with no "help" from Gods.I doubt f that gives you any comfort. I note also that the poll included only the United States. Christianity s nt a U.S.monopoly, although certain Christians love to make that claim. God is a personification of mankinds most noble conscience and Ideals; a construct of our fear and ignorance and determination to overcome both. The bible is a collection of observations from past experiences peppered with references to "god." As there is no free will, logic is literally an afterthought. The universe determines your path, not the other way around. Perhaps "Michael, Thou Art God" Or, if you like, "Forgive them, they know not what they do" also fits. Chill, your going to see it as you choose, if you know it or not. There is free will. The universe may have its way with you, but you choose how to react to it. Dragging religion into a science discussion is like farting in an elevator. And then trying to defend yourself by saying it smells rosy. and claiming you will go to hell for not believing it. Hello, everybody! We're so fortunate that we need not feel upset to live together with the dinosaurs on Earth. Good Luck to girls, boys, men and women! The only use I ever found for the Bible was to rip a page from it every night to roll me a joint with it to enhance my concentration to study Physics while in college. What? But they can only be 5000 years old! Check out calnewlanministries.com. It's new and improved! Who cares about old dinosaur eggs anyway? Those things are thousands of years old! Imbecile...you and whoever listen to your gibberish. Very good, James. You've got to get up pretty early in the morning to fool James Foley! LOL! We've been addressing this ignorance for .. how long, now... since the Scopes trial, at least. And has it gone away? And you think one more prim, tight-lipped little lecture will finish it off? You really DO need to get out of the lab more! By the way, your reference to me as a "Doosh" was neither scientific nor funny enough to quaify as sarcasm. Misspelling notwithstanding. 1. I wasn't being sarcastic and 2. Learn the difference between a misspelling, implying either accident or ignorance of correct spelling, and a deliberate alteration in order to avoid a flag 😉 God does exist... as a concept. Period. End of story. I guess "Doosh" will have to do for someone who couldn't come up with a more biting and original insult. I note, also, you had resort at another point where words failed to a smiley face. Apparent;y you skipped English class on more than one occasion. Actually, it was a winky face, but who's nit-picking, right? *sigh* let's do this again, from the top... Mankind did NOT... I repeat DID NOT evolve from apes. Mankind evolved from what apes evolved from, but we are not and never were direct descendants of apes. That theory was concocted at a time when speculation was as rampant in science as it still is in religion. We are all products of divergent evolution, not (c) evolved from (b) evolved from (a) evolution. You people, being funny or not, going around saying dinosaurs didn't exist are all living in denial. You people pretending dinosaurs existed in the same time as man are also living in denial and bolstering what you already believe with speculation to comfort your own doubts. But please, do continue, we all enjoy how you punctuate your ignorance with certainty. Very well put James, I have this same discussion all the time with people. Bless you, James. I bet you skipped English class the day they taught sarcasm and irony. I was about to say, Your loss. But then I reaiized that your lack of perspective and humor and the school marmish tone you adopted in correcting the rest of us simply reinforces the old stereotype about scientists - that they are pale, joyless creatures who emerge from the lab only long enough to sniff disapproval. No doubt, James, there are a few slack-jawed imbeciles on this blog who really believe dinosaur never existed or if they did it was in Biblical times. The rest of us, desperate to retain our sanity without lapsing into curmudgeonry, have resorted to the only response to these people that is possible ridicule. I'd suggest you look in the mirror, take a deep breath, fix yourself a nice cup of tea, and have a good laugh. At them, first. And then at yourself for taking them seriously. It's a blog, for heaven's sakes. Not the latest issue of "Nature." Funny thing is, even if your God is real, what happens to you today STILL won't mean much to you in heaven. For instance, why would you care about what some atheist said on a CNN forum while sitting in heaven? The fact is, while we may wish there was some grand eternal meaning to things, the fact that there isn't doesn't mean they have no meaning, things have meaning to the people that are involved at the time they happen. So, yeah, after I'm dead I won't care one bit about what idiot religions exist. But that doesn't mean they don't harm living people today, or in the future. so what you are saying is, believe or else? kinda like holding a gun to a person and saying love me or die forever. real nice moral and ethical worldview you got going there. This is why I am Pagan lol. I do believe my life has meaning – the meaning that I put into it and any actions or changes for the better of not just humanity but the planet who birthed myself and the brother & sisters of all nations (2 legged, 4 legged, winged, creeping, standing, stone, sky, etc, etc). I don't need to be frightened of an eternal damnation & suffering to have good moral values. There's enough suffering for everyone & everything to go around just to survive one lifetime. I love the sciences – they teach me the wonder & workings of Nature & the Universe to whom I've dedicated my life & study. Correct, that is exactly right. God's own alleged actions prove he does not exist, at least not as described by Christians who claim he is perfect, omnipotent and loving. Ah kin prooove thet Jeeezus road on a dinee-sore. We all know Jeezus fed a large gathering with one fish. Well, that fish could only have been a HUGE dinee-sore-like fish. Therefore, ichty-o-facto, it can only have been a dinosaur that was alive not long before they ate it... though the bi-bull conveniently fails to mention if'n anywun got food poisoning... but the point is, I dun proved yew rong. I figger that Jeeezus and his merry band of men also ate up all the last of them dinee-sores at the last supper (the last supper of prime-grade A dinee-sore meat, that is). Hope this helps to set you on the path of righteousness. Scuse me while I go find a snack... all this food talk has made me hungry and I'm gonna wake up my submissive biblical wife to get her to fix somethin' (fringe benny-fits uv being a believer). Mankind evolving from apes is the reductio ad absurdum version put forward by Christian religious fundamentalists to ridicule the Law of Evolution they so fear and thus try desperately to discredit. @ConfucianScholar Sorry to be pedantic, but there is no Law of Evolution in biology. Why make up a term when the existing terms function just fine? It makes those of us on the side of science look bad, or insinuates that we don't think that the existing scientific framework is enough to withstand this simplistic creationist criticism. Ok. Even if dinosaurs did exist they were probably gay. Saurians exist all over the place. You probably even ate one or two in the last week. I have 4 of them living in my backyard and feed their friends and them daily. What is the matter with you... Blind. You city people wouldn't know where an egg comes from and probably have never seen how corn or other vegetables grow. Dumb, dumb dumb. I think for most of us trying to comprehend how the world has changed or imagine what it was like even just 2,000 years ago is fairly difficult. Does anyone here really thing the Earth and the creatures were all the same millions of years ago as they are today or believe they will look the same in Millions of years. Sit down and really try to comprehend time before you can really say they exist or not. Is that why they went extinct? No, Seth. They went extinct because they didn't get on board Noah's Ark. might be cause I've been drinking,but Teacher,that was funny!!!!! I don't think any of these posters exist at all – they're just a figment of the website. Could the posters have evolved from humans? There is zero proof that dinosaurs ever existed. Oh yeah and there is this old white grumpy guy in the sky somewhere.. whatever rocks your boat dude. As a scientist I am an old white grumpy guy. I still say there were never dinosaurs on the earth. If there were they would still be alive today roaming the wilds of África. I just ate a dinosaur today. And I saw a rather large one stalking prey from above while driving. The flightless dinosaur I ate is called a "chicken", and the dinosaur stalking its prey was a "golden eagle". There are dinosaurs roaming the planes of Africa. There are dinosaurs surrounding us daily. Not all dinosaurs died, they lived on, and are quite well adapted to the enviornment. Science will NEVER be able to disprove a god exists as long as it is true. So, why are fundamentalists even a little concerned? It is because science CAN prove that over-simplistic fundamentalist interpretations of the bible are often untrue. That means, you can only continue to believe fundamentalist misinterpretations by living in denial... when the evidence of the truth, planted by the god you claim to believe, is in front of your blinkered eyes. There is no proof of dinosaurs? Do you think your god buried gigantic bones under mountains of earth as an April Fools joke? You've been misled. We all get duped. There is even less proof of the existence of your intelligence. Dinosaurs never existed. It's a fact. The bones are fakes. There are no bones, only rocks. There is no Dana... there is only Zu'ul! so they are rocks, in the shape of bones? then we must have rocks in our bodies, not bones. You sir, are ignorant of the truth. Rocks are not composed of the same material bones are, that is why you can determine the date of rocks. Rocks have been here since the planet formed, well technically after it cooled, but nonetheless, they have been here a very long time. Look at the theory of an atom, and you will see how the universe works, on a micro scale. Just LOVE to know,"Anthropologist": What are your credentials as an anthropologist? Degrees? Publication in recognized professional journals? Dinosaurs never existed. We all know it and need to admit it to ourselves. The dinosaur myth is a fallacy created by scientist to increase government funding. It has been proven time and time again that dinosaurs never existed. Every paleontologist knows this but uses their fake plaster of paris creations to raise money. There just weren't any dinosaurs. You sad people need to just get over it. I agree. We evolved from apes and not Dino's. millions of years ago ape like creatures roamed the earth. There is endless scientific evidence to verify this fact. Even photos and paintings. No one has yet to find a live dinosaur walking around. Dinosaurs are just fake. The existence of dinosaurs is just a conspiracy theory. No one but the tin foil hat crowd believes there was ever such a thing as dinosaurs. Just as it's been proven over and over that wombats never existed. (Have you ever seen one? Anyone you know seen one? Just out of curiosity: Professor of what? Man existed with dinasours. in the paluxy river in glen rose texas there are man foot prints along side dinasour tracks. in the limestone for all to see. i wonder how this sits with the earth is only 6 thousand years old tea bagger republicans. if you don't believe it about the tracks google it. Eroded dino tracks (toes/claws eroded). Absolutely no fossil evidence for hominids being around 65 million years ago, although little squirrel-like proto-primates were starting to appear at that time. Misidentification at best and outright hoax at worst. Agreed. Dinosaurs were a hoax. They never existed. No proof of them ever actually being here exist. Man existed with dinosaurs? Absolutely. The remains of the dines are called birds. We do, in fact, exist with the evolved species. Would that include mammoths,mastodons, saber-tooth tigers? What about pterodactyls? Trilobites? Mosasaurs? (I watched the bones of one of those being dug up a few years ago standing right beside the lady who discovered the bones while hiking in a creekbed.) Or does your claim of nonexistence extend only to the dinosaurs? Note to the author, when you convert units you need to conserve significant digits. roughly 1242 miles? It looks like you converted roughly 2000 kilometers to 1242 miles. This is an incorrect conversion. You added 3 significant digits. This might seem like nit picking. But if you are going to write an article about science you need to follow the rules of science. Don't write statements that pretend to be more accurate then your data. Please look up what a significant digit is before you write another article on a science topic. Since you could really choose any number of kilometers around 2000 to the nearest kilometer (i.e. 2002 or 1998) depending on where in each city you choose to measure from, maybe the author just averaged to 2000 and converted to miles, thereby preserving significant figures. Don't be such a know-it-all. It seems that you need to learn the difference between "then" and "than." BTW, 2000 km is 1242.742 miles. So roughly 2000 km is indeed roughly 1242 miles. Roughly means "In a manner lacking precision"
Maybe the author converted from 1999 kilometers and then rounded to 1242, which would also preserve significant figures. There are so many possibilities floating around that you really shouldn't be correcting the author. Especially since the rules for significant figures sometimes don't account for ambiguity of precision. Note to poster: you don't understand significant digits. In this particular case, trailing zeros are simply ambiguous; we don't know what the actual measured precision was. In such cases, it is common practice to assume that all digits are significant. Also, that '2000' came from you – not the author; it isn't even clear that a conversion was performed at all. Are you seriously trying to suggest that when converting 2000 km to miles you would report the result as 1000? Can they extract the DNA out of the embryo and do a Jurassic Park? That would be interesting (or has it already been done?) Not much of a conspiracy guy, but it has to go through one's mind. OK. Is anyone savvy enough to know if they can collect DNA? Or perhaps, those savvy enough don't bother with a blog at the end of a story. Because the sample is fossilized the DNA is destroyed. Minerals have replaced the cellular structure-thus a fossil. I doubt much if any DNA would have survived this long. And even if some did we wouldn't want to waste it on cloning since at this point we are still pretty bad at cloning animals. Any DNA would be so fragmentary that it would be useless for sequencing. DNA half life is 521 years, with all DNA being destroyed after 7 million years. Even if you found a few base pairs, which would be a remarkable discovery, there wouldn't be much that you could do with it. There is zero proof that DNA ever existed. DNA is a scam fabricated by so-called "scientists" to get government grants. The same goes for embryos. Same goes for scientists. Frankly, I don't believe in them. i post. Therefore I am. Embryos are clearly a fantasy cooked up by the poultry and egg industries for the purpose of attracting larger agricultural subsidies. However, there is very good proof that idiots exist. See post I am commenting on. If the Bible tells the story of the earth, then why doesn't the bible talk about these Dinos and explain everything? Hey, pal, do not question Bible. Of course everything written there is true. I am happy to base my life on believes of bronze age tribes even though there is absolutely no proof for any of the believes. And, of course, I am more than happy to give a part of my salary to the church. Dinosaurs did exist but only several thousand years ago. You are right that they are not mentioned in Bible, but Sarah Palin clarified that one. That's correct. Because when it comes to science, the bible most certainly is NOT true. Nor was it ever intended to be a textbook on physics, astronomy, geology or paleontology. It is concerned with other things entirely, and approaches them using liberal doses of metaphor. You'd think some animals like the larger Dinosaurs would be mentioned though since you know, they kind of are hard to not notice. Job 40:17a states it sways it tail like cedar. What animal in the world has a tail that can be swayed or (erected) like cedar. What is cedar? bible usually refer cedar like a large or a tall tree. Indeed, the tree of Lebanon can grow up to 130 ft with a diameter up to 8ft 2in. For argument sake, let's say a cedar is 20 ft. Now what animal in the world today can erect it's tail 20 feet high or has a tail of 20 ft. None. But some of the dinosaurs sure did. They are called behemoth and Leviathan in the bible. I don't understand why so many people think dinosaurs don't exist just because the Bible doesn't talk about them.. That would be like saying horses don't exist becuase they aren't mentioned in my book about dentistry.. That's not the point of the book.. The Bible couldnt include every detail of every animal.. it doesn't even include every detail of Jesus' life. If it did, it would take years to read. I don't get my science from the Bible. And I don't get my theology from Darwin. So far, that's worked out pretty well. You might want to check your ancient Hebrew. Be·he′moth (or vehe·mohth in Hebrew)... is a hippopotamus. Now you are close on Le·vi′a·than but not quite. That is a dragon (liw·ya·than in Hebrew). Thank you very much. I did believe Sarah Palin when she said that Dinos were around six thousand years. However, I have lived in agony ever since! Because I believe both Sarah and Bible (with the same credibility!) but I couldn't find any Dinos in Bible. Now, you have clarified it and saved me further headaches. The Cedar Dinos were the missing link! Go Cedar Dinos! The "Bible-Sarah Palin-Cedar Dinos" problem has just been solved. The editor cut those parts out to keep it from getting too long. Humor aside, in the fourth century CE, Constantine threw out nearly a third of what comprised the bible before then. I guess I'll just throw out this mysterious Barbasol can I found on Isla Nublar. How would you like them; over easy, scrambled, extinct, or on the rocks? I think they were just sort of sticking to the egg laying ones this time. I think they're referring to the now-widely-accepted theory that birds are the descendants of dinosaurs, and are now in fact classified as "avian dinosaurs." Dinosaurs were not reptiles as both their name and the author indicates. Physically, they were perhaps closer to mammals than reptiles or were the grandfathers of the bird. You're wrong they were reptiles. Many dinosaurs were very active so many scientists believe some of them were warm-blooded but they were not mammals. However their is ample evidence that birds are directly descendents of dinosaurs. Duckbill Platypus comes to mind. A Monotreme, not a placental mammal. The Echidna is way cooler. Oh, Bill. "Dinosaurs were not reptiles as...their name...indicates"
Whatever their anatomy says, etymologically dinosaurs are literally "terrible reptiles." It's from the Greek.You could look it up. We need gun control quickly, before we become extinct, too! blame inanimate objects for our own shortcomings.....well done. To bad we can't clone a group of Tyrannosaursus's then we could unleash them on N Korea. It wouldn't live very long in the modern world. Now the know what happened to the dinosaurs. They were all aborted. ..yeah, by a third trimester asteriod from the Cretaceous period. About 65 million years before fundamentalist denialism was created, jack-wagon! !